Most of the characters in this film are female. 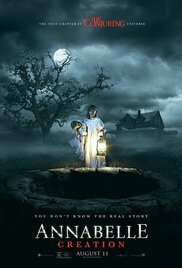 There are a few men, Anthony La Paglia as the doll maker, Sam Chambers, a priest driving a bus for orphans who also blesses a sinister house, police at the end and some adoptive parents. But, there is a great emphasis on the women, from Miranda Otto as Esther, the doll maker’s wife. And there is a little daughter who very early in the film is killed in a car accident. Most of the action takes place 12 years later with a bus load of orphans, under the charge of Sister Charlotte (a very sympathetic nun played by Stephanie Sigman), who have been invited to transfer their institution to the Chamber’s house, a vast and somewhat Gothic exterior with a myriad of rooms. The two youngest girls at the centre of the drama, Janice (Talith Bateman) and Linda (Lulu Wilson), are two very convincing performers, especially Janice who is taken over by the evil doll who was possessed by the Chambers’ young daughter. Interestingly, there is quite a Catholic background to The Conjuring Universe. The Chambers go to church on Sunday, ask the priest to bless their house when it falls prey to the sinister presence of their daughter possessing the doll (and a reasonable explanation given later in the film). The children are Catholic, pray, are guided well by Sister Charlotte – with, interestingly, Sister and Janice sitting back to back but Janice formally making her confession to Sister Charlotte. 1. The Conjuring Universe and its development? The Conjuring films, Annabelle, themes of evil, possession, the possession of the doll? The prequel? 2. The period, the past, the American midwest, the countryside, dry and mountainous, the open roads? Church, town, home, workshop? Costumes of the period, the cars? The musical score? 3. The background of The Conjuring, the Warrens and their exorcisms, the doll in the museum, the drawing on Catholic background characters for these films? 4. The feminine sensibility of the film, the characters, behaviour, possession, suffering? Not a film for macho audiences? 5. The credibility of the story, dolls and evil, the later explanation about the death of the daughter, the prayer of the parents, contact with her – religious or not? The consequences? Destruction, cruelty and their deaths? 6. The Catholic tones, the initial going to church? The couple, accepting the orphans, Fr. Massey and his driving the bus, St Eustace orphanage? Sister Charlotte and her presence? The background in Romania? The scene of Fr. Massey and his assistant blessing the house? Themes of prayer, faith, Sister Charlotte and her hearing of Janice’s confession? 7. Sam and Esther, as a couple, their love for their daughter, his making the dolls, fulfilling orders for the shops, happy? Playing the game with the notes: Find Me, and its latest sinister use? The calm, the breakdown, the piece on the road, the crash and the daughter being killed? 8. The passing of 12 years, St Eustace’s as an orphanage, the need for accommodation, Sister Charlotte and her presence, Janice and Linda chatting on the bus, Janice and her polio? The other girls? Arriving, happy, an opportunity? 9. Esther and Sam, the situation, the large house, the talk, the secrets, the locked doors, the chair to lift Janice to the top floor? Sam and his being dour? His wife and her confinement, the locked door, the mask and her disfigurement? The welcome, the cautioning? Sam and his death? Esther and her talking with Sister Charlotte, her being crucified on the wall? 10. Sister Charlotte, pleasant, the background in Romania – and the post script after the credits about the convent in Romania, the connection with The Conjuring 2 and foreshadowing The Nun? 11. The girls, ages, characters, interactions, the two older girls, the middle group, Janice and Linda? The rooms, the lessons, meals, ordinary life? 12. Janice being curious, opening the door, discovering the doll, the door shutting? Her watching, confessing to Sister Charlotte? Going back in, urging Linda? 13. Carrol and Nancy, the cover, the sense of presence? The girls and their reactions? 14. Janice, her being possessed, the consequences, in the barn, the mayhem and fear? Sam’s death, Esther talking and her fate, and, Sister Charlotte being hurled against the wall? 15. Linda, the continued searching, in the dumbwaiter? Her escape? The barn? 16. The girls gathering, the house exploding? The decision to leave and the travel the bus? The doll in the house? 17. Janice and her adoptive parents, their meeting with her, 12 years passing, the murderous outburst? 18. The post script about Romania and the sinister nun?